MAX 2011 – the big yearly conference for all-things-Adobe – is coming up in just two months in Los Angeles, California… And continuing our long tradition of free Adobe giveaways, we’ve got one free and full conference pass (worth $1,495) to give away, plus one $400-off ticket discount, both courtesy of our friends at Adobe Systems. Adobe MAX 2011 will be chock full of expert keynotes and presentations, technical ses­sions and talks, surprise announcements and sneak-peeks, evening events and get-togethers, and possibly some freebies. In fact, most of the over 200 training and tutorial sessions from MAX 2010 were recorded and are still available on-demand for free viewing, covering all Adobe tools. Enter your email for our free exclusive Adobe Special Offers e-Newsletter in the sidebar to the right (once in a while, never spam, and unsubscribe any time). That’s it! Each of these actions counts as a single entry into the drawing – so if you do both, you’ll receive two chances to win the prizes. Please, one entry per reader for each method, but be sure to share and tell your friends and colleagues who’d like a chance as well. Submissions are open until 11:59pm EDT on Tuesday, August 30th, 2011. The winners will be drawn at random from all valid entries, and contacted via email – and we’ll announce the lucky recipients (first names only) right here the next day. The prizes are in the form of two special, unique vouchers that will give one completely free conference attendance, and one discounted registration. Good luck and spread the word! And even if you don’t win either prize, find out how you can save $400 on Adobe MAX 2011 yourself! Contest is open to residents of North America, Europe, United Kingdom, Australia, New Zealand, and South Africa, with up to two entries per person as outlined above. By entering, all entrants agree to release ProDesignTools.com (the Sponsor), and its employees from all liability and claims relating to participation in the contest. No substitutions or transfer of prize or cash redemptions permitted by winners. Sponsor reserves the right, in its sole discretion, to cancel, suspend or alter the rules and parameters of the sweepstakes. Sponsor also reserves the right to substitute a prize or prizes as Sponsor deems suitable in the event that prize becomes unavailable for any reason. This is an awesome opportunity for Adobe fans. It would be a great opportunity to meet some interesting people and get some new inspiration! i am a web design and development student in texas, with just two semesters left before completion. i would love to attend, but winning is probably the only way i’ll be able to do so. i’m enamored by the web and all of it’s possibilities! adobe helps me make my visions reality, but i know i haven’t quite unlocked the full potential of adobe’s products. i’m positive adobe max 2011 can help me with this. I didn’t even know this EXISTED! It would be absolutely awesome to attend! Hello Adobe, I am a 40-year-old college student who knew nothing about computers a year ago. They have become the main focus of my education. My absolute favorite field is digital design. It would be the highlight of my year to go to Adobe MAX. I really want to go to this conference! So many good sessions and labs to pick from. I would be following the Flex developer session track learning about the new Flex Mobile capabilities. I hope I am the winner! I am a freelance designer and this would be a wonderful opportunity to get the latest Adobe training and meet others like me in the industry. Hope I win! I am a graphic design student who just graduated college and this would be a great chance to network. Also the sessions and labs at the conference look like they are jam-packed with good info. I am a front-end web developer at an agency in Blacksburg, VA. While my company is sending two Creative Developers to AdobeMax, there was not enough in the budget to send any of the Content Developers (there are about 20). We’re big Flash people here (about 70% of our revenue) and the Content Developers, who work solely in Flash, are the workhorses of our Flash development. It’d be really nice to send my coworker, Tom Yancey, to this event, as he has time and time again put forth extra effort to write white papers on new and evolving technologies like traditional Air, Air for Android, and Wallaby. I think this would be a really great opportunity for him to grow as a developer to see the full capabilities on the forefront of Adobe technologies. I am a digital scrapbooker and would love to begin designing, but I feel I need to upgrade my software before I can become “serious” about it. Adobe’s products are so multi-leveled that training can only bring more enlightenment to my current understanding. I am a web developer and this conference would be a dream come true to attend this year. So many good technical sessions to choose from!! I love adobe products and use them everyday for work. Having the chance to listen to the keynotes and attend sessions and labs would give me an edge at work. It will make me the “cool kid” that everyone wants to hang out with. I really, really, REALLY want to win! Here is to good karma.. I am currently a coldfusion manager/developer in california and have been utilizing adobe products for the last 10 years. 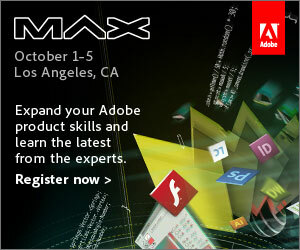 Adobe max is the ONLY professional conference available to coldfusion developers in california. Unfortunately the price is too steep to justify as a developer since the coldfusion aspect is only one small portion of the huge event. Show some love for adobe’s coldfusion product and send a devout user/representative! Adobe MAX is jam packed with designers and front-end developers, bring some diversity to the party and send me! I’m a Flex developer, blogger and founder of a Flex-based social networking site called Xuland (still #1 most-visited site on Adobe Feeds http://feeds.adobe.com/index.cfm?query=byMostPopularYear). I’m currently building an AIR-based mobile version that is drastically different. I am the CEM of a Technology Consulting firm primarily serving the Baltimore / Washington areas. Economic hardships have caused us to cut our travel budget this year. Our company does use Adobe products for some web design and development currently, however there is no one toolset that we use exclusively. I would like to be able to attend Adobe MAX to see how Adobe products could further enhance our ability to bring services to our clients. This would be an amazing opportunity to attend Adobe MAX – not just for personal development for BELOW THE BRIM.com but for the new “adventures” we are embarking on at DISCOVER Financial. I work at an agency and we are finding ourselves becoming more dependent on Adobe tools like Dreamweaver, Flash, InDesign, Photoshop, Acrobat, etc to produce work in a timly fashion across multiple platforms. I’m getting asked more often about new tech Adobe is deploying that I am having to ramp up faster and faster on. I really think MAX would help me get more connections in the Adobe community so I know where the resources are and would also expand my mind on how to better use Adobe products. Mind you it would just be awesome to go to it! I am a freelance web developer and Adobe product user who would absolutely LOVE to go to Adobe Max this year. I am just starting to learn how to use Flex and Flash Builder to make mobile apps. I would learn sooo much from attending this conference. Please pick me to win!!!! I am a graphic designer and I use adobe software every day. Attending adobe max would give me insight into the latest adobe techniques, tips and tricks. The keynotes will give me a peak into what adobe has planned next. This would be an exciting conference to attend, and I will be very lucky if I am picked as a winner! Did you pick the winners yet? Hi Fred, in fact we are in the process of drawing and confirming the winners right now! We should have the announcement here shortly… Thank you for your interest and inquiry! And here they are, as promised – the two winners of our Adobe MAX Ticket Giveaway! Thank you to all who participated, for all the wonderful comments, and to Adobe Systems for generously sponsoring this promotion. And please stay tuned for another great giveaway here, just around the corner! Attending Adobe MAX will allow me to keep up to date on the latest technology, best practices, deploying to multiscreens, and will help me work smarter. Sessions with JimBabbage, RBlank, Garth Braithwaite, LeeBrimelow, JonathanCampos, JesseFreeman, ChrisGeorgenes, David Hogue, Joseph Labrecque, Elaine Montoya, Greg Rewis, Grant Skinner, Stephanie Sullivan Rewis, Michelle Yaiser and too many others to list here, will help me sharpen my skills. I expect to leave MAX feeling energized, inspired and relevant in today’s marketplace. MAX is fantastic and I hope to be going back this year! This is the best conference to learn the latest and greatest from the best. big up to MAX! im a senior graphic designer in swaziland at one of the leading newspapers in the country, but we have been struggling in terms of getting the right programs to execute adverts for our newspaper and in terms of upskilling my knowledge of adobe programs. been having difficulties because we using corel draw x3 and i did my studies in south africa (boston media house) where we got to learn the whole adobe suite. i would love to learn more and i believe in order to be creative, you need to go out there and learn more about new programs and thats what i want my junior graphic designers to learn. Buy Adobe After Effects CS4, Get CS5.5 Free When is Adobe Photoshop Elements 10 Coming Out?